Donations, supplies gathered, distributed for Bluegrass State storm victims. 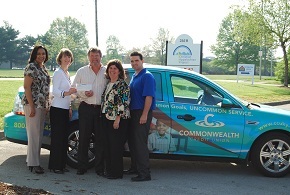 From left, Commonwealth’s Lynette Wooldridge, Danielle Luigart, the Christian Appalachian Project’s Johnny Thompson, and Commonwealth’s Cindy Block and Bryan Douglas with a check for that organization’s tornado relief efforts. The staff and management of the $897 million, 83,000-member Commonwealth Credit Union in Frankfort, Ky., has responded to devastating tornadoes that struck the state in March by raising funds to help those who had been hurt.